The animation shows a moving body on an incline. The angle of the plane can be changed. If the angle is sharp enough, the object begins to slide downwards. This is called “sliding friction”. 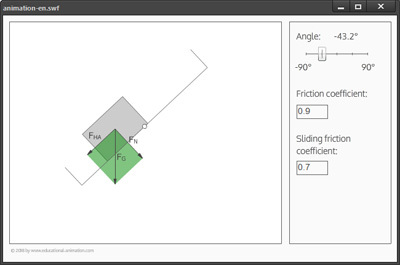 In the animation, the weight force (FG) and the resulting slope drive force (FHA) and the normal force (FN) are shown. When the slope driving force (FHA) overcomes the adhesion (drag), the object slides downward.